The moment you've all been waiting for! 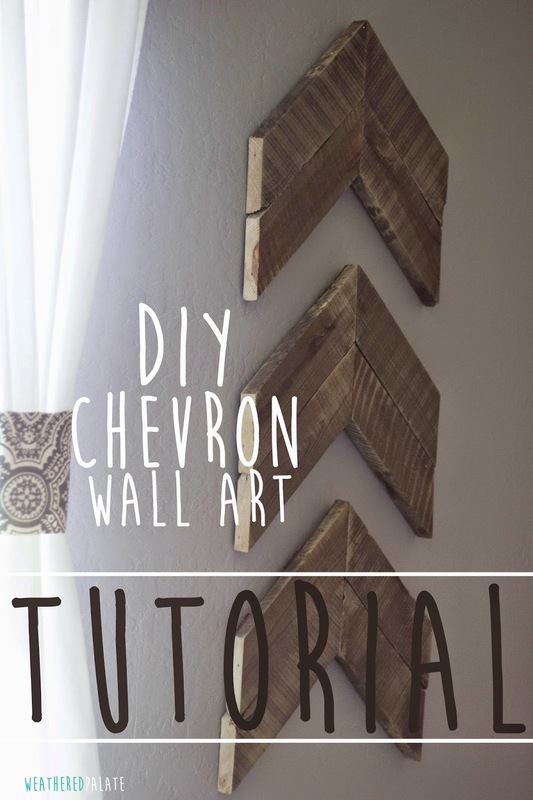 The Chevron Wall Art Tutorial is here! I am so excited about this project. It has been so fun working along side my husband making these. I saw this idea originally on Pinterest but there was no tutorial on how to make them so we figured it out as we went along. 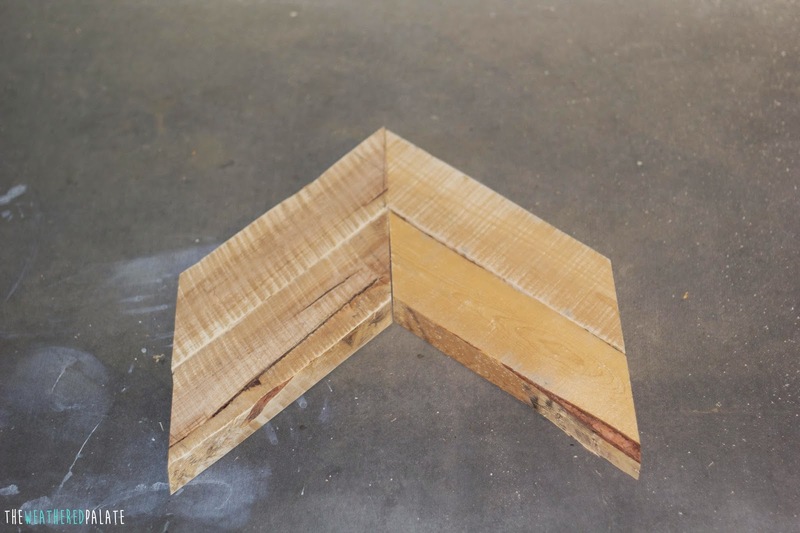 We learned a few things along the way that I will share with you as I walk you through the steps of how to make these chevrons. 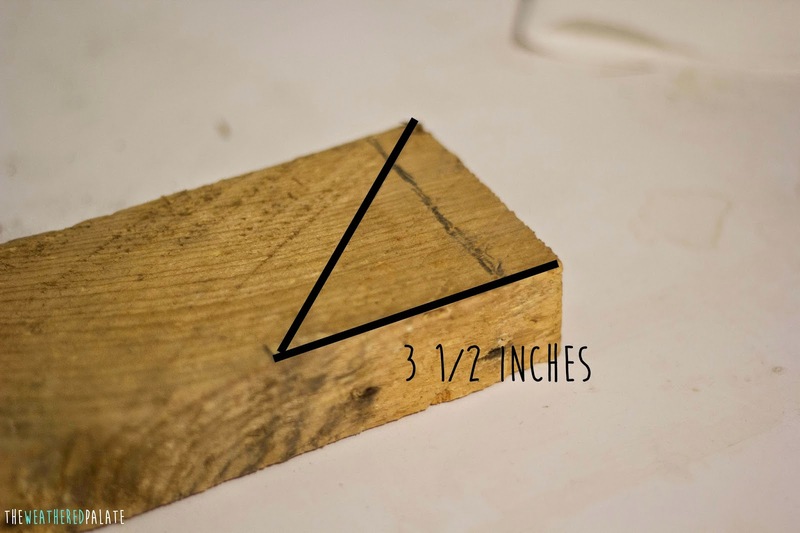 Note: We created these measurements off of pallet wood that we already had. 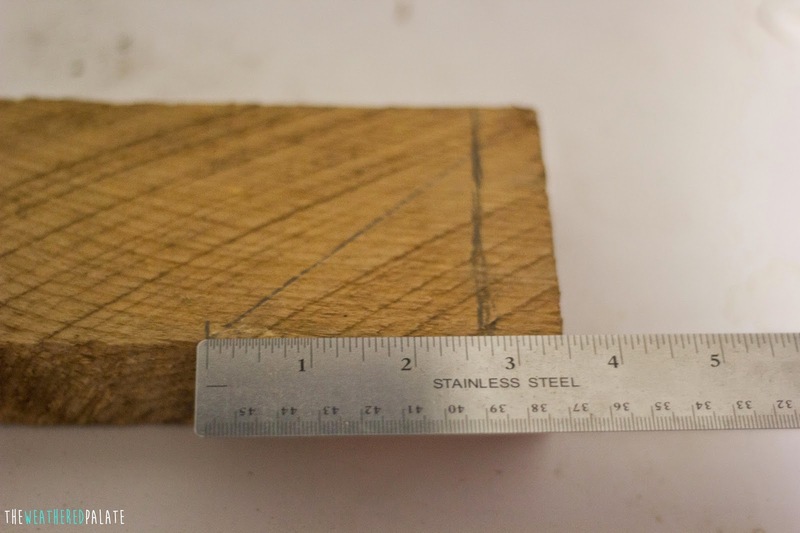 I told my husband I had 4 boards and needed 3 pieces from each board which is how we came up with the measurements that we did. 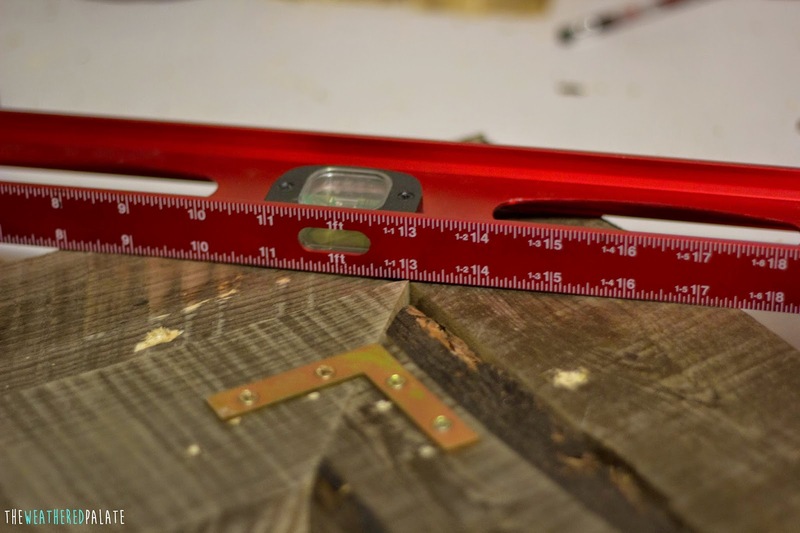 You may find that you need to adjust your measurements depending on your wood. Just remember, you're cutting 45 degree angles. 1. Our boards were 3 1/2 inches wide. So to make the 45 degree cut, we measured in 3 1/2 inches from the end of the board. 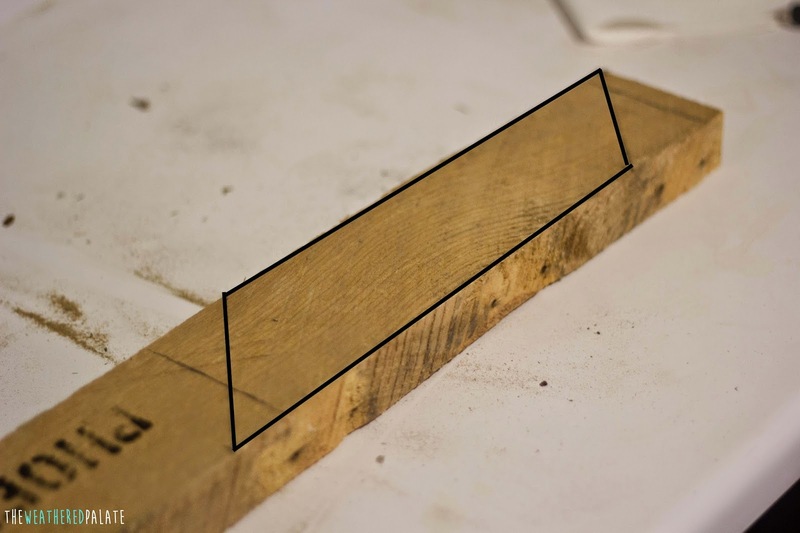 Then draw a diagonal line from the top corner, down to the end of your line, making a triangle. 2. Mark 11 1/2 inches on the top and the bottom from the measurements you just made. Repeat, making 11 1/2 in. 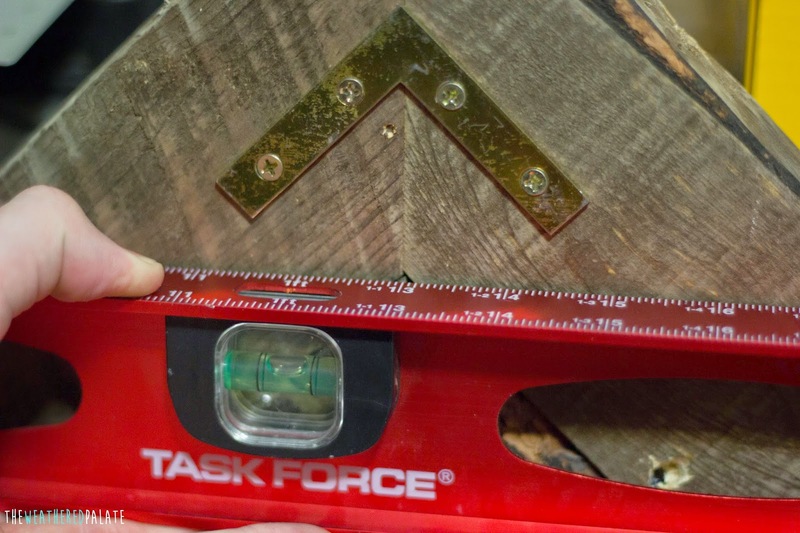 marks until you've measured 3 pieces on each board. 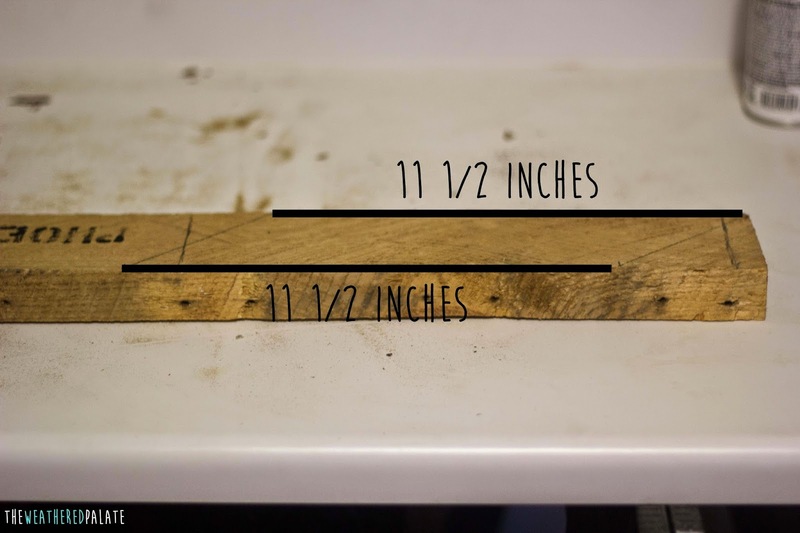 You should have twelve 11 1/2 inch long pieces when you're finished. 3. 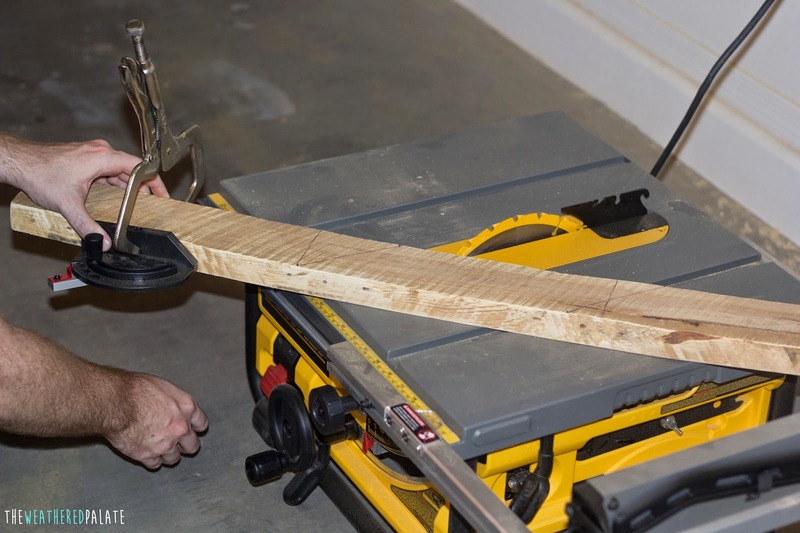 Set your miter gauge on your table saw to cut at a 45 degree angle. Clamp wood to miter gauge to hold in place. 4. 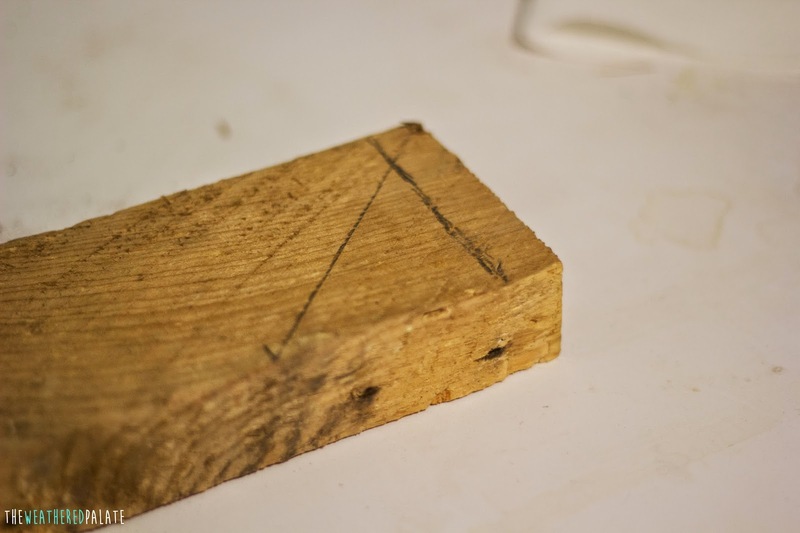 Carefully adjust the wood to line up with your first line. 5. 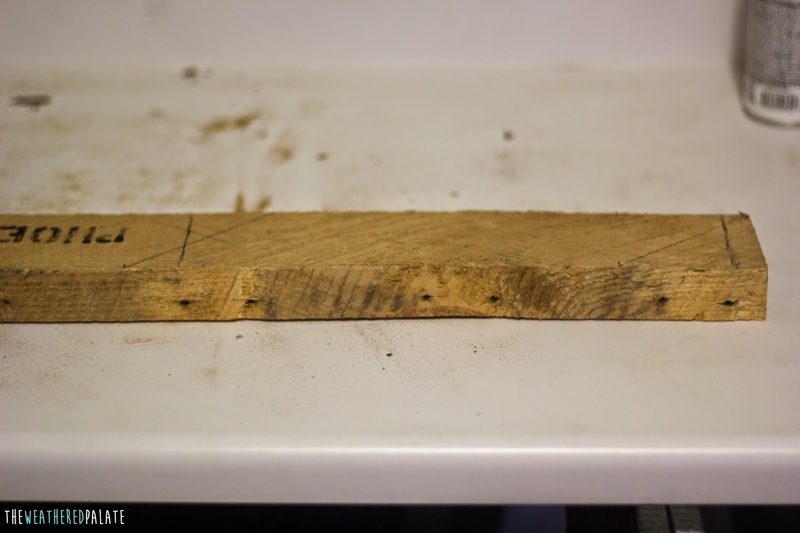 Turn saw on and gently guide the wood across the saw cutting each piece. 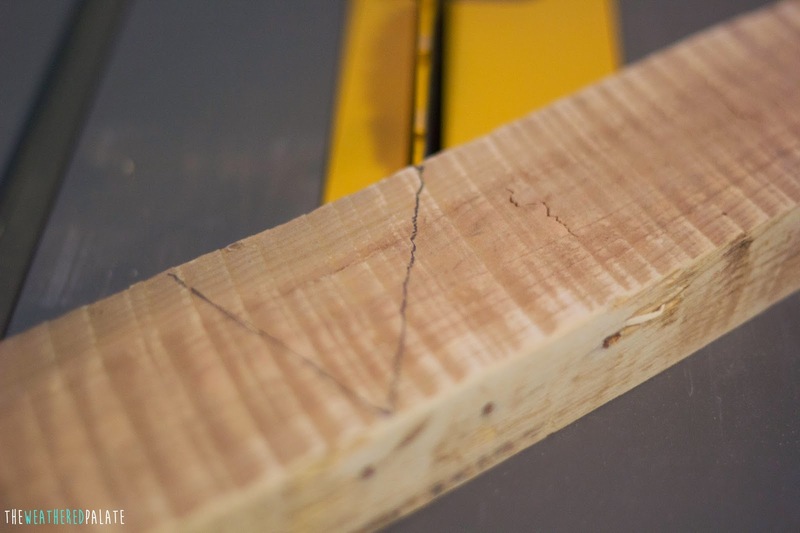 Repeat with each marking until you have cut all 12 pieces. 6. 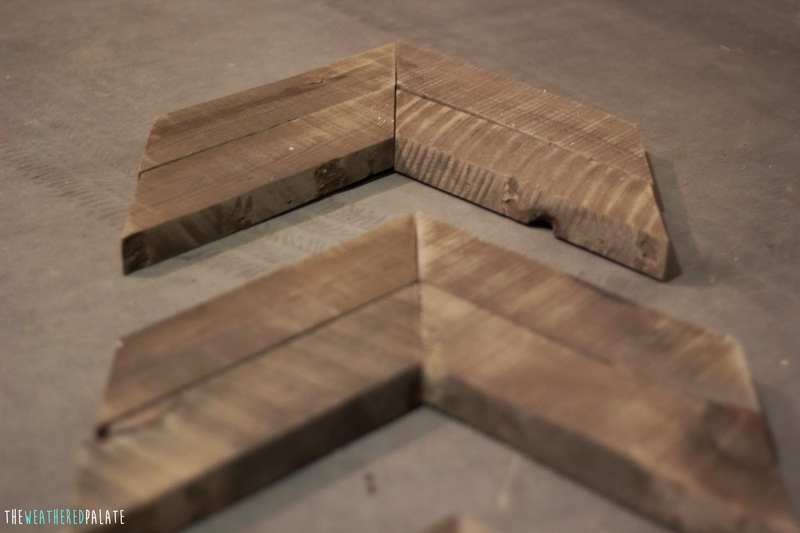 Sand each piece to smooth edges and splinters. 7. 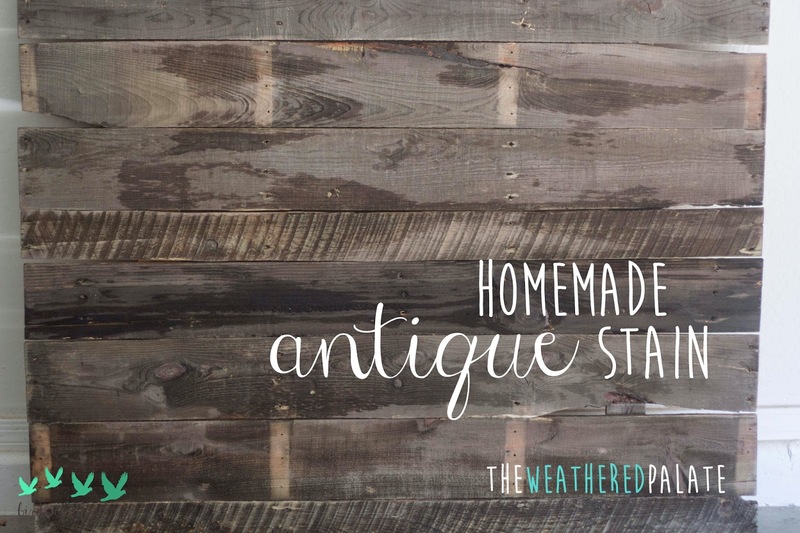 Stain each piece with Homemade Antique Stain. Let dry. 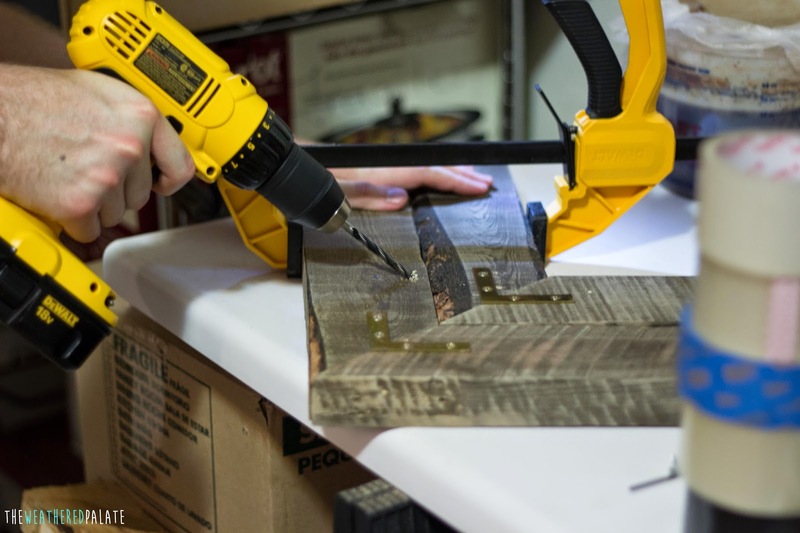 We let ours dry over night before assembling them but only a few hours is necessary. It was late and we were done working for the night. 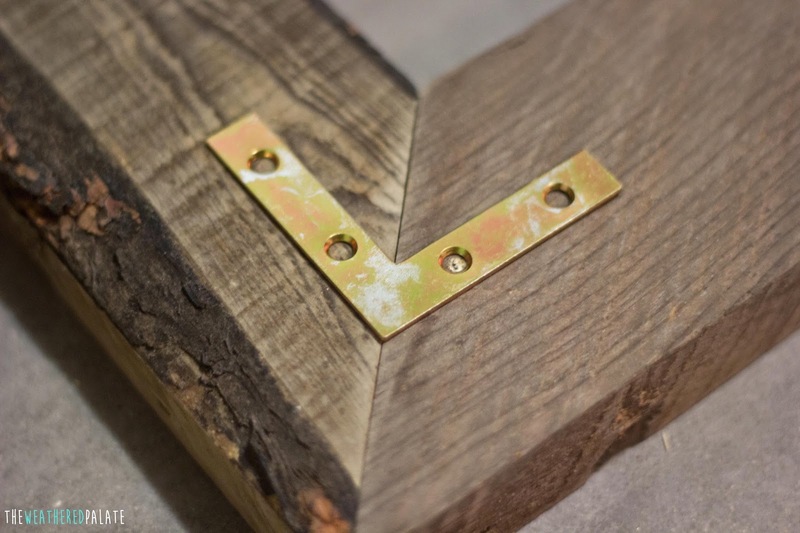 For this project, we added a little bit of water to the stain to lighten it up. 8. This next step is tricky. 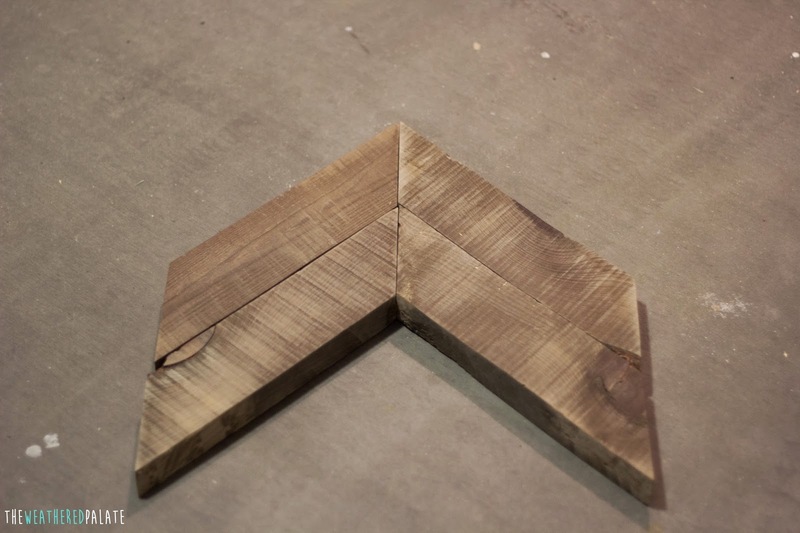 Because the pallet wood was so uneven, some pieces were thicker and some parts were a little wider than others causing them to not all line up evenly. We had to find which sides lined up the best. 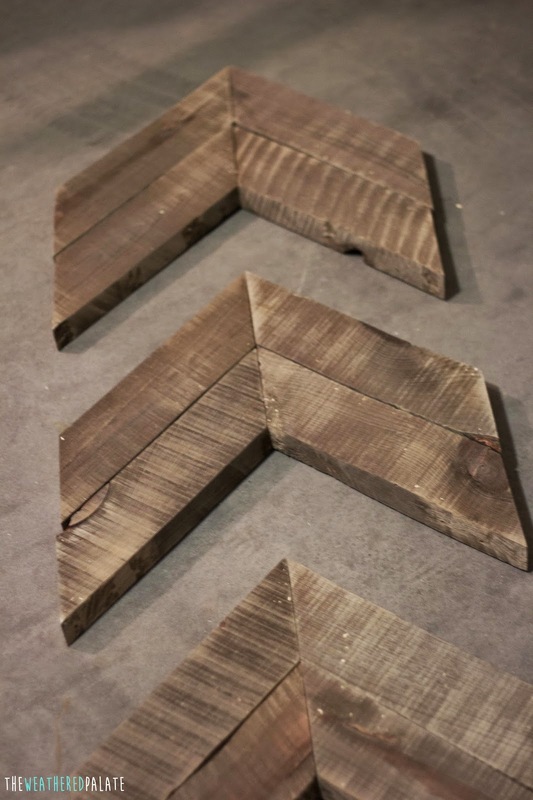 Luckily, it's a pallet project so imperfections are welcome. 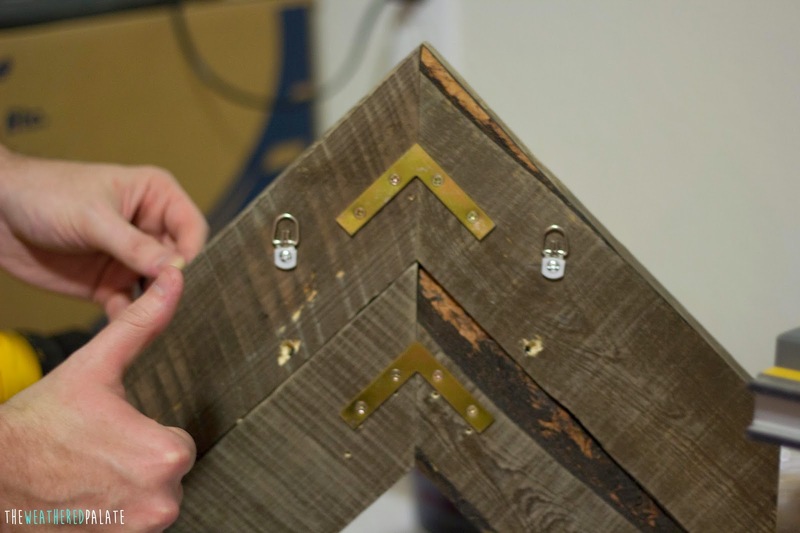 Once you have the pieces matched up, turn them over and place your L bracket over each piece. 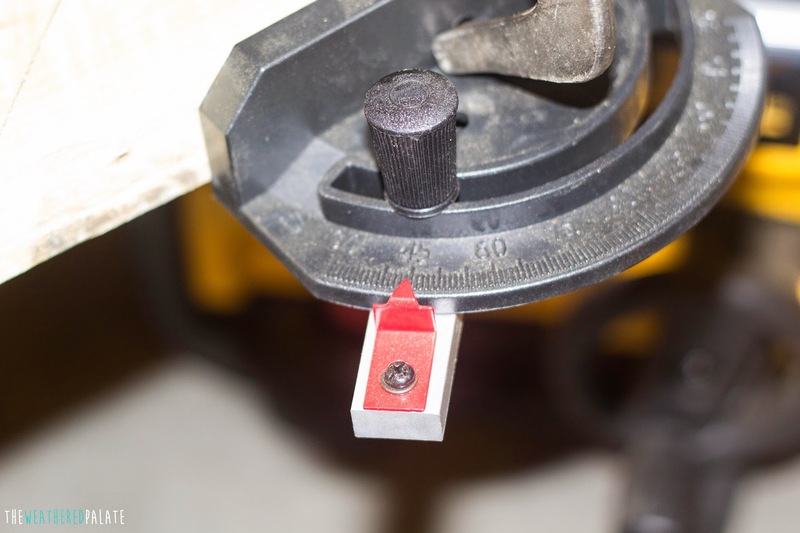 Mark the center of the hole with a center punch before you secure the L Bracket. 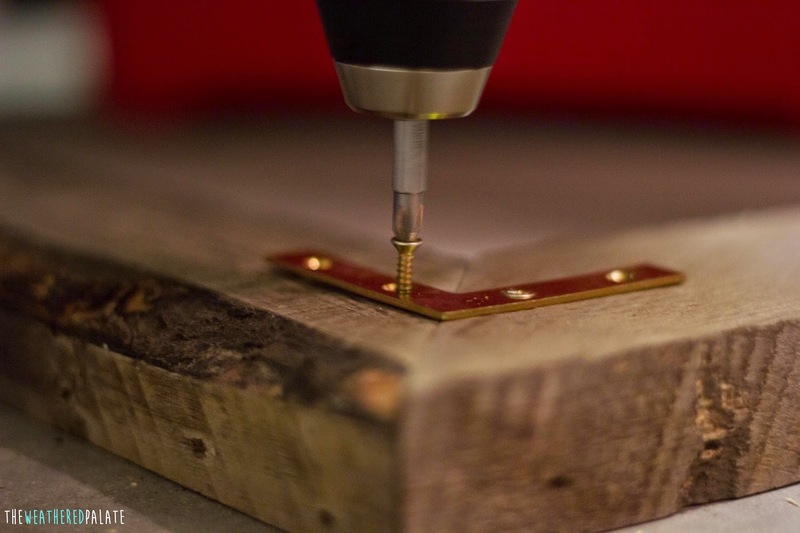 This allows for a nice little indent for the screw, making it really easy to screw in. 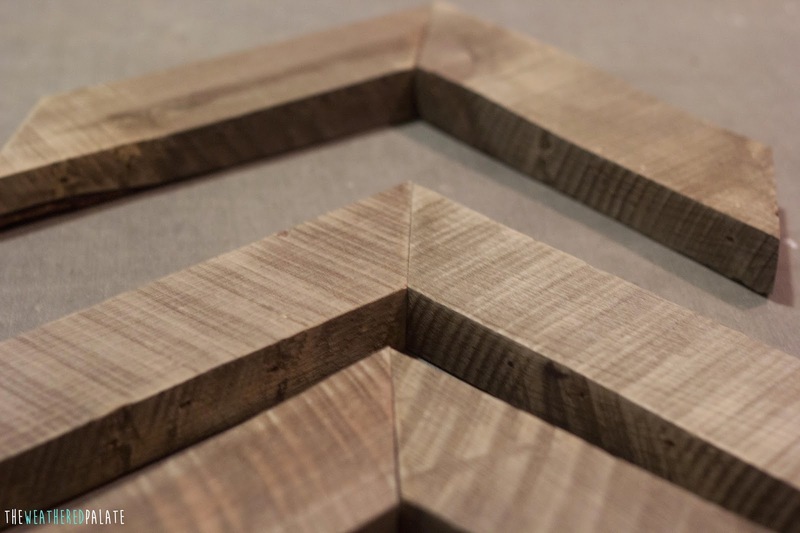 Secure each chevron together. You should have 6 chevrons when you're finished. 9. 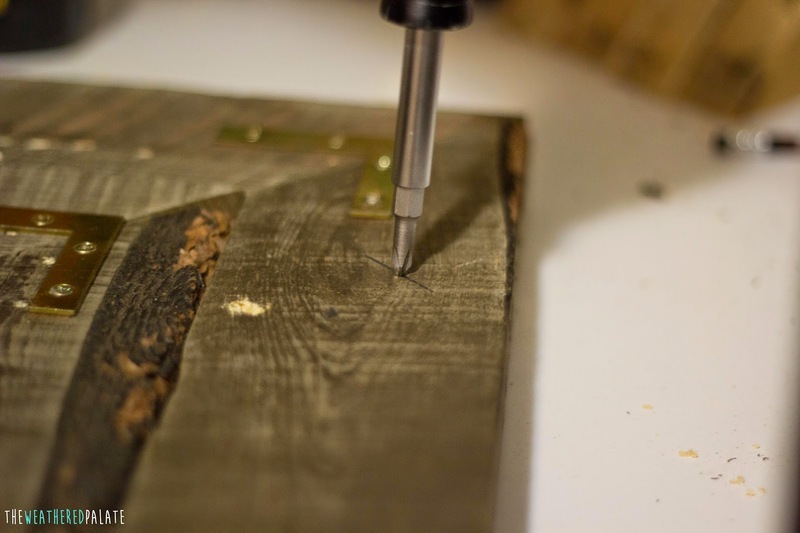 This next section would be so much easier if you had a pocket hole jig. We don't, so we'll show you how we secured ours together without one. Since completing this project we have bought one and love it. 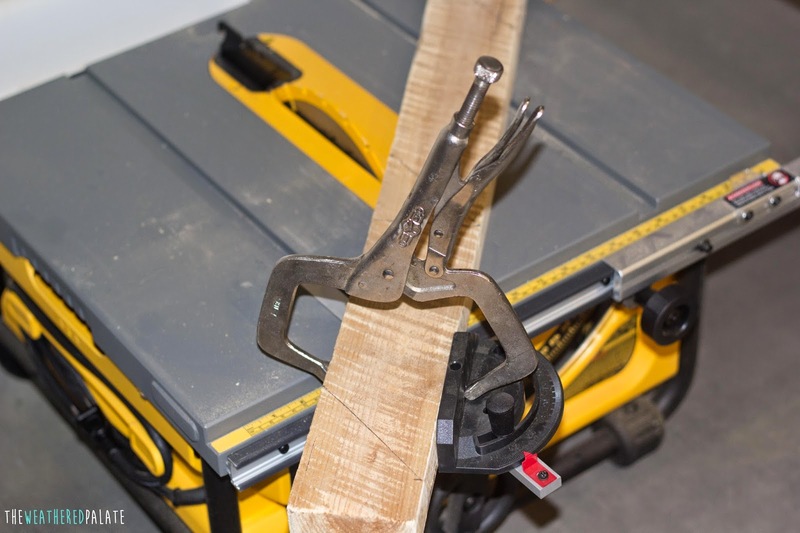 Clamp your pieces together, using two clamps. 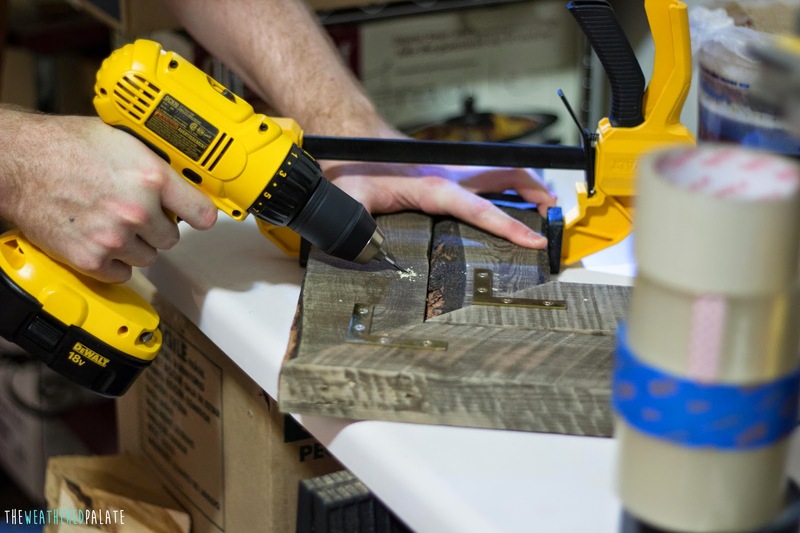 We used a drill-bit a few sizes smaller than our screw to pre-drill the angle we wanted for our screw to go into to secure each piece. Pre-drill two holes, one on each side of the chevron. 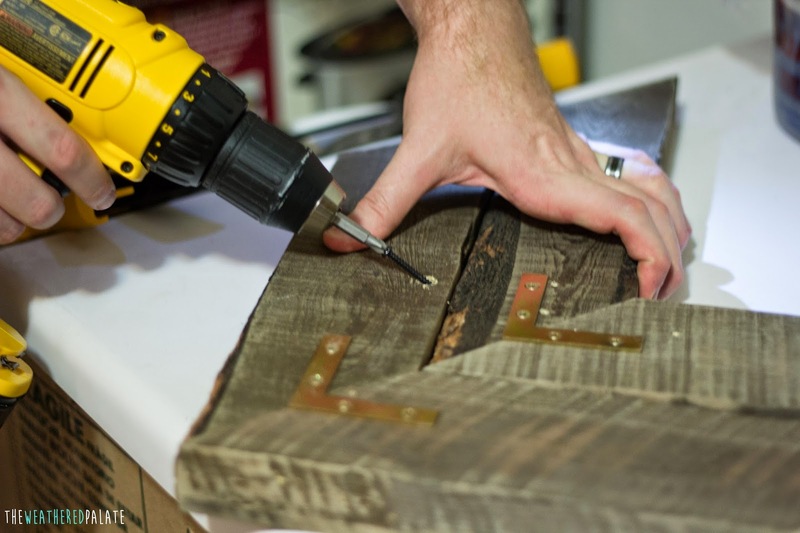 You may find that you need more than 2 screws to secure the pieces together. There was one piece we needed two screws on each side. 10. 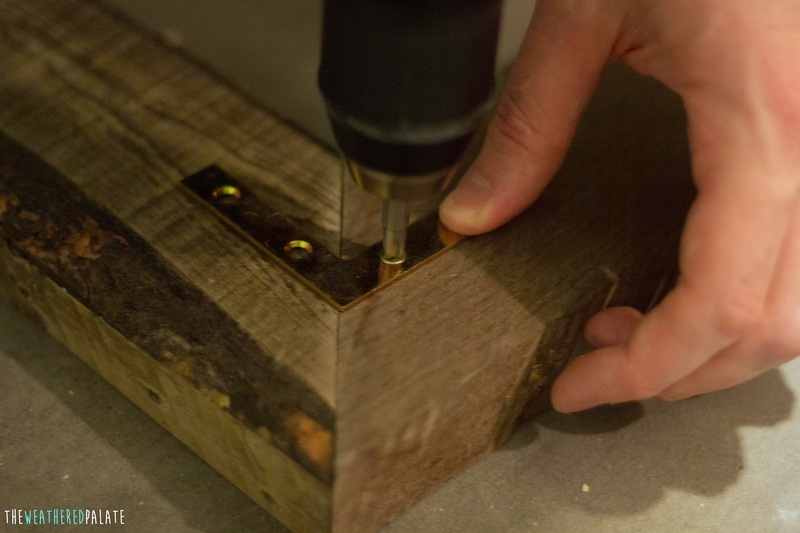 Now use a large drill bit to make a bigger hole going straight down about 1/2 inch where you pre-drilled your angle. 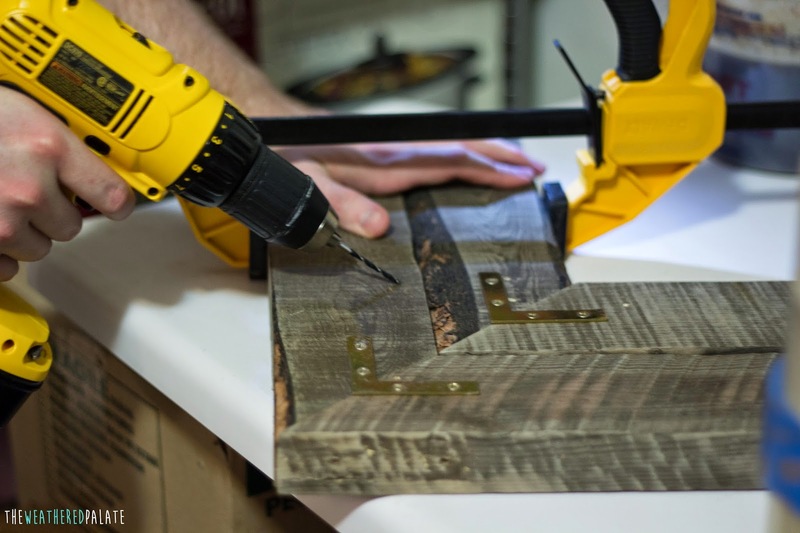 This will allow room for the screw to enter and hide the head of the screw which will allow them to lay flat on the wall. 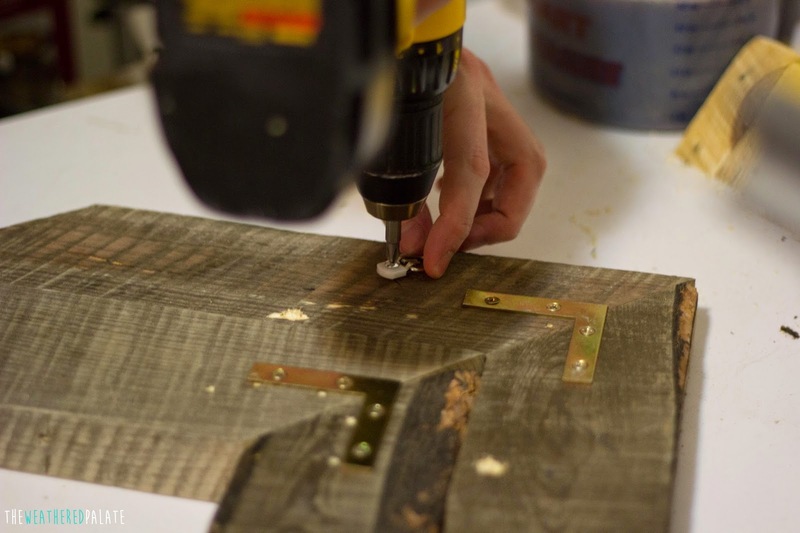 Once you have your angles pre-drilled, screw in your screws. Repeat for each set of chevrons. You should have 3 sets of 2 chevrons when you're finished. 11. Now it's time to hang them. We used D brackets to hang these on the wall. If you come up with a different way, let me know what you did! Check out the finished product, here!